Even though some of our customers are large hotels, colleges, or restaurants, the majority of our orders are placed by individual homeowners. In lieu of references, we provide comments from past customers of ShutterLand Exterior Shutters. We welcome the opportunity to provide you the same quality shutters and service, and invite you to explore our web site, and utilize our toll-free phone support. The shutters were delivered in a timely fashion. They were exactly like the way they were pictured. We are very pleased with the shutters. We get many compliments. This was my first time using Shutterland. The company was always professional to deal with and kept me informed of the production timeline throughout the process. The shutters were extremely well packaged and arrived in perfect condition. I ordered multiple raised panel shutters in redwood wood species. The shutter quality was excellent and I would not hesitate to use them again. Shutterland has been a great company to do business with. Our house took a direct hit from Hurricane Irma last year when the storm made landfall in our ocean front yard as a Category 4 storm. Fortunately our concrete house is a bunker like structure and withstood the storm quite well.We wanted to dress up the street side of the house so we added your shutters to diminish the bunker like look, a big improvement.Your company was great to deal with and the quality of the shutters is top notch. I ordered custom size exterior shutters from ShutterLand and they are awesome! They look great and really add to the beauty of our home. Thanks for the quality work! We had an excellent experience with ShutterLand. Our shutters were delivered in the time frame we were told and were the proper size and of excellent quality. This is the only web site I found that was truly adequate for ordering quick shutters without any other contact. Very convenient. I recently ordered some exterior shutters from your company. I want to tell you how impressed I was with the quality of your work. I honestly hated the thought of having to prime and paint them since they looked so much like a furniture grade product. Thanks again for the great workmanship. Please pass this along to the people on the shop floor - they deserve to know they are appreciated. I had a question about priming the shutters and your representative, Jack, gave me a very quick and useful response on just how to prime and paint exterior shutters. In addition, they arrived exactly on schedule and were very well and carefully made. Thanks. My wife and I recently purchased four cedar shutters from you. They arrived on time and in perfect condition. I just wanted to let you know how impressed we were with the quality of wood you use, the quality of construction, and the quality of workmanship. These are wonderful shutters. The wood is so beautiful we hate to paint them. We plan to order shutters for two more windows in the future and you can count on us buying them from you. Much better than my "in-store" experience. Great exterior shutter selection and prices! I was so happy to find your company online and you had exactly what I wanted at a good price and excellent workmanship. Wooden exterior shutters are well made and beautiful. I just finished painting them and can't wait to get them on my house! The best shutters we have ever had, and I can't believe we ordered them on the Internet! I have given your web address to many of our friends and neighbors. I was amazed at the quality of your window shutters. It was far superior to any other house shutter material I have purchased. Excellent quality material and a smooth finished exterior product. Great selection of sizes and styles of exterior window shutters; easy to order online. Delivery was timely, the quality outstanding. It was a pleasure to be your customer. 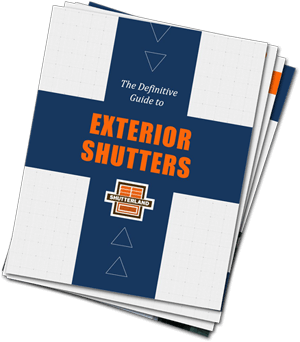 Having checked many sources for good quality combination house shutters, I found ShutterLand to have a good selection with the sizes I needed and excellent quality. The replacement exterior shutters I ordered are all painted and up on our newly painted house and they look great. Our painter intends to recommend ShutterLand to other customers that need replacement wooden exterior shutters. This painter, by the way does only restoration work. We are very pleased with the fast service and quality of product; we have had many compliments on our raised panel shutters and are happy to recommend ShutterLand, not only for service and quality but for GREAT PRICES! The exterior shutter looks like a work of art. The other house shutters that I have are either molded plastic or older wood ones that have been on the house 25 years. I know that after painting this one and putting it up that it will last at least 25 year. Thanks for the great craftsmanship on the outside shutter. I have an older home and wanted to keep the authentic look of raised panel outside shutters. The original wood shutters had been painted numerous times and were rotten at the hinges and joints. I tried to repair them, but couldn't get them to look very good. I ordered your shutters (with a bit of healthy skepticism, I might add). Your outdoor shutters are great and they look as carefully crafted as the originals. I'll be back to order more. Thanks! The shutters arrived Monday, right on schedule. They are SO BEAUTIFUL. I just wanted to stand and admire them. I HATED to paint them. They seem to be perfect. I wish I could watch the manufacturing process. Give your workers kudos from us! I just want to say how much I LOVE the shutters I ordered from y'all (yes, I'm from South Louisiana so I don't say "you all"). I closed in the end of my back porch with your exterior wooden shutters and I can't tell you how much I am enjoying them. The quality of workmanship is amazing and they look beautiful. I experienced some problems with the shipper damaging the first shipment, but Brian promptly sent replacement outdoor shutters. I have already recommended ShutterLand to my family, friends, and neighbors. It's hard to find this kind of service, quality workmanship and great communication in today's market. Thank you so much ShutterLand. My exterior louvered shutters arrived today. Just beautiful!!! I almost hate to have to paint them. They are sturdy, well constructed and much more than I expected. The cost for such quality is unsurpassed. I have already referred a friend to your web site to buy exterior shutters. Thank you for your fast service and emails regarding delivery, confirmation, etc. Your company should be proud, there are not many like you. Very satisfactory experience with your company. Well made shutters and good service. Thanks! Shutters were made with excellent, quality materials and delivered undamaged and in a timely manner. I would definitely purchase from Shutterland again! Being somewhat of a woodworker myself, I was very impressed with the quality of workmanship that went into the shutters. I will no doubt use your service when I'm ready to do the rest of my shutters. Thank you! My experience was great. Thanks. These are the best shutters (quality and price) I have found anywhere.